Umesh missed out in the first Test against South Africa as captain Virat Kohli decided to play three fast bowlers in Mohammed Shami, Bhuvneshwar Kumar and debutant Jasprit Bumrah. Image Source : PTI A file image of Umesh Yadav. 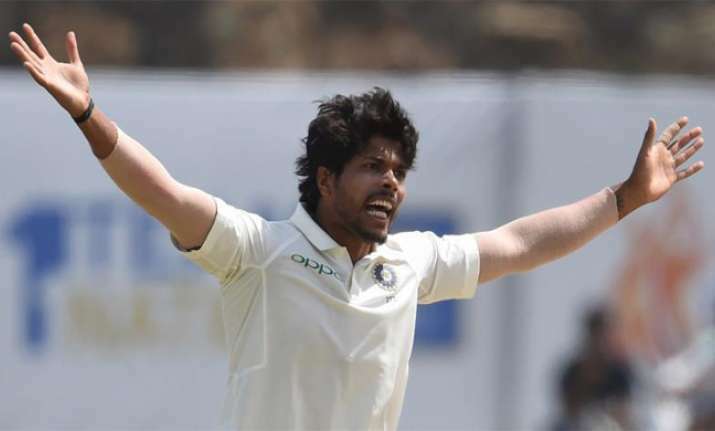 India fast bowler Umesh Yadav, who missed out from the playing XI for the ongoing Cape Town Test, managed to impress South Africa's experienced pacer Dale Steyn. Not with his speed and accuracy but with his tattoos. After reducing India to 28/3 on Day 1 of the first Test on Friday, Steyn was spotted checking out Umesh's body art ahead of the Day 2 at Newlands on Saturday. "Tatt check - how many more have you got on that arm? @dalesteyn and @umeshyaadav exchanging ink ideas #SAvIND," Indian Cricket team captioned the picture on Instagram, where the two cricketers can be seen engaged in tattoo talk. Umesh missed out in the first Test as captain Virat Kohli decided to play four fast bowlers in Mohammed Shami, Bhuvneshwar Kumar, debutant Jasprit Bumrah and Hardik Pandya. Besides pacers, lone spinner Ravichandran Ashwin made his space. South Africa have picked up four fast bowlers including Dale Steyn and a spinner Keshav Maharaj. Currently, the hosts appear on top as they forced India to 186/7 in 62 overs, leading by 100 runs in the third session on Day 2.